Winger Matt Ritchie thinks Bournemouth are unlikely to win a fair share of decisions against England's top teams. 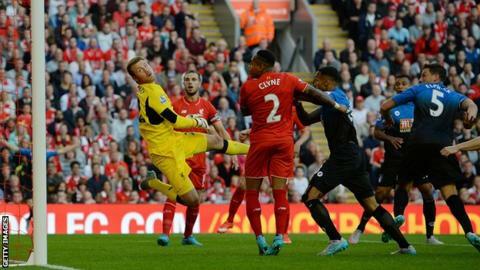 The Cherries, promoted to the Premier League for the first time, suffered from two debatable decisions in the 1-0 defeat by Liverpool at Anfield. When asked if it was a concern, he said: "It is not a worry, it's a fact. "Referees are only human and, when you go away to big stadiums, to give decisions against the top teams is probably a little bit harder," he said. The Cherries thought they had a goal wrongly disallowed against Liverpool, whose winner should have been ruled offside under new guidelines introduced this season. "It was a tough one to take," Ritchie told BBC Scotland when asked about Monday's game. "It was always going to be tough going away to Anfield. "We gave a good account of ourselves and I'm sure, if we keep performing the way did, we should be OK."
Christian Benteke's controversial goal separated the sides, with Philippe Coutinho in an offside position as he tried to reach Jordan Henderson's cross before the striker. "Anyone who knows the new rules knows it was clearly offside, but that's football," said the Scotland international. He also thought referee Craig Pawson should not have pulled up Tommy Elphick for a foul on Dejan Lovren as the defender's early header found the net from Ritchie's corner. "The referee's got a difficult job, but looking at the replay, it's soft," he said. "If you give that as a foul, you'd be giving fouls every five minutes in the box."